In 2017 we had 97 demonstration houses! 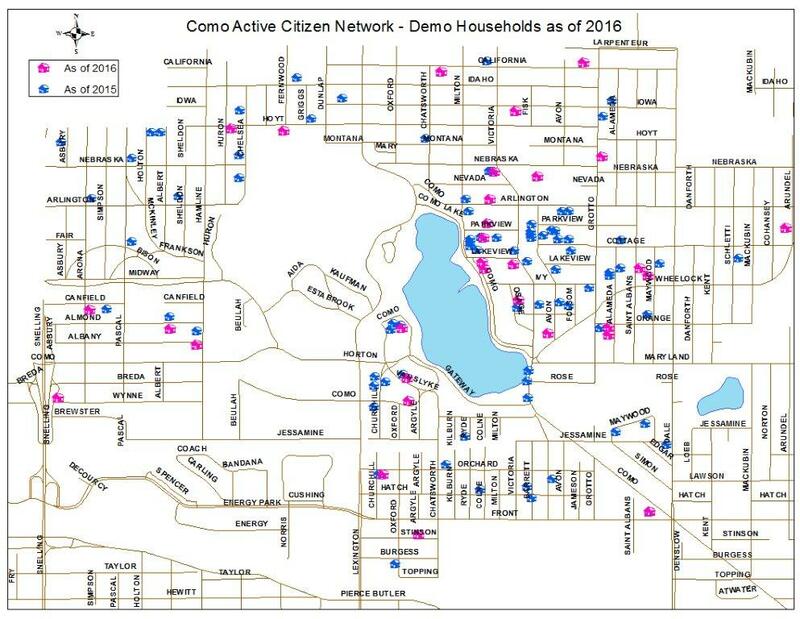 Demonstration houses (DHs) are the backbone of the Como Curb Cleanup project. 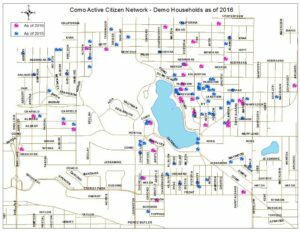 DHs own or rent property in the Como neighborhood. They demonstrate the practice of weekly removal of leaf litter that accumulates in street gutters that border their property. This is done throughout leaf drop season – October through November. 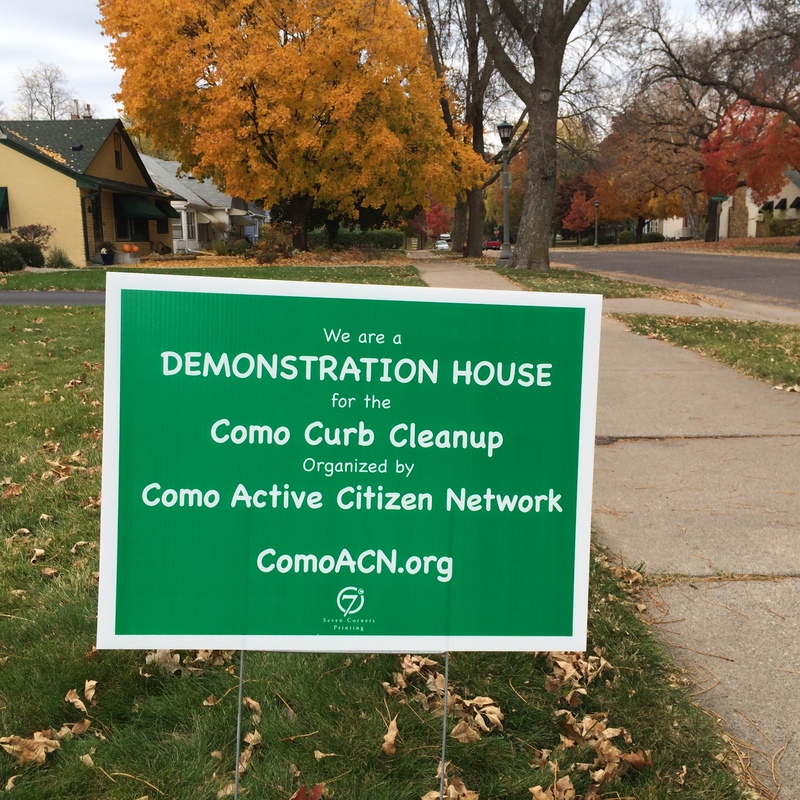 By engaging in this practice collectively, across many Como neighborhood blocks, we are able to synchronize and maximize our water pollution prevention impact. 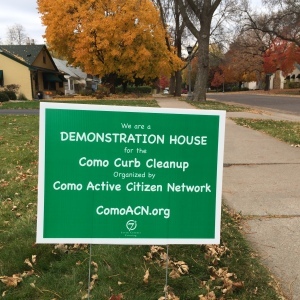 To be a 2018 Demonstration House send your NAME and ADDRESS to LeadTeam@ComoACN.org . What exactly does a DH do? Display a DH lawn sign in your front yard. Once a week, during October and November, remove any accumulated leaf litter from street gutters that border your property. Your curbs don’t have to be leaf-free 24/7. Weekly removal of any accumulation is plenty. Keep this practice simple, otherwise you might avoid doing it. Sweeping or blowing accumulated curb leaves up onto your boulevard until you’re ready to manage the leaves in your yard is perfectly fine. Removing leaves from the hard surface of the street before rain (runoff) mixes with them is the crux of this practice. When you are ready to tackle yard leaves, you have several options: 1. MOW over them to create lawn mulch or 2. RAKE them and then a. COMPOST them in your backyard or b. TRANSPORT them to a Ramsey county yard waste site or c. bag them (in a compostable bag) to be HAULED away by your trash company. At the end of leaf drop season (our first significant snow or Thanksgiving, whichever comes first) the CACN leadership team will email you with a link where you can report the length of curb area you cleaned. From this we will calculate our aggregated, collective impact. Lawn Bag. If you are interested in a 135-gallon capacity, reusable lawn bag to help manage your leaves, we have an agreement with a distributor that will give us a discount ($25 per bag) – we just need to order them four at a time to get the discount, so you’ll need to find three other neighbors who want one too (or order more for yourself). 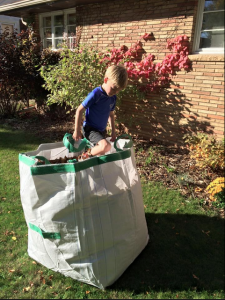 You can use the bag to transport leaves to a Ramsey County yard waste site or to deposit them into a homemade, simple leaf composter.